Benefits of heavy squats. Heavy squats benefit the entire body. Have you ever wondered what the benefits of heavy squats are? We’re always told that doing weighted squats are one of the most beneficial exercises you can do. But why is that, and are the benefits of heavy squats any better than doing a normal weighted squat? Well in today’s article we’re going to be going over all the details on the types benefits you may or may not gain from doing heavy squats and also some of the other effects doing weighted squats will have. Aside from that, let’s continue on with the content and get down to discovering what the benefits of heavy squats really are. We all know that squats are the most effective exercise for gaining muscle. And when you squat heavy, the benefits are even more impressive. 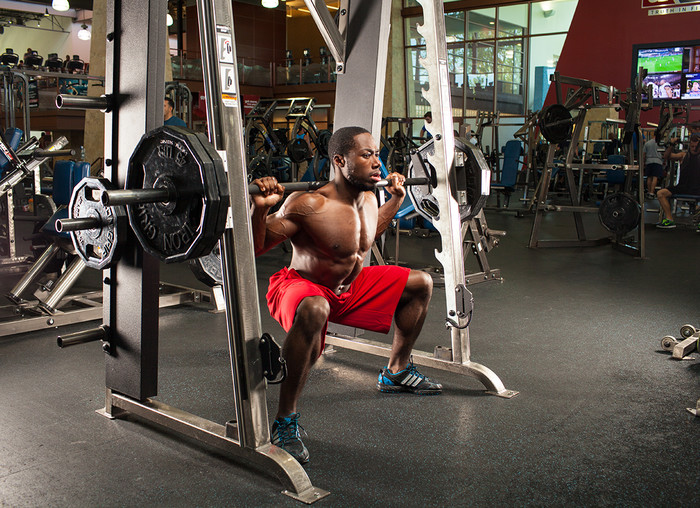 When heavy squats are done the right way, you have the potential to really pack on muscle mass. Squats build up your quads, hamstrings, glutes and calves. How Do Squats Increase Testosterone? Because you need a lot of strength and energy to do a heavy, barbell squat with the correct form, your body is forced to release extra amounts of testosterone and growth hormones. This can be a major benefits of heavy squats specifically for men. Related article: Do Squats and Deadlifts Increase Testosterone? Endocrine glands in the body produce hormones. These hormones float around in your blood and eventually turn into a muscle cell to bind to a specific hormone receptor. Anabolic hormones such as testosterone, growth hormone, and growth factors all signal the body to build some muscle. Stress from heavy resistance movement raises the anabolic hormone levels after exercise. The amount of hormone the body releases varies based on certain factors. These hormones stimulate muscle growth and repair. This allows you to increase muscle mass throughout your entire body and not just your legs. Blood flow to the muscles is increased with resistance training. This will bring more anabolic hormones to the muscle. Related article: Squats Increase Testosterone Hormones. You will see your entire body benefiting from heavy squats. By adding heavy squats to your workout routine you will eventually increase the amount you can bench press. Women who squat with heavy weights will see an additional benefit. Their legs will have an even layer of muscle mass. The more muscle mass you have, the less fat and cellulite will be noticeable. After building up leg muscle, staying fit gets even easier. Your body burns an additional 50-70 calories a day for every pound of muscle you gain. Heavy squats train your central nervous system to brace your core to protect your lower back. Squatting with more weights improves your range of motion through the entire hip area. One major benefit of heavy squats is as you age your bone and joint health can be maintained and improved with squats. All the muscles used when squatting help stabilize the body during sudden movements to keep the body safe. Like everything else in the body, your bones will respond to the stimulus placed on them. Your bones will become either weaker and brittle, remain the same, or become stronger. For your bones to grow a few things have to happen. There has to be some stress or loading here, and the load has to be greater than a previous stimulus for the bone to deform or stress. Once the bone has been stressed, osteoblasts cells–responsible for bone formation–will form new bone. But all this will only happen if the load or weight is great enough. If the weight isn’t heavy enough, your body will not adapt because there is nothing to adapt to. This is why you need to squat heavy. If you’re squatting heavy then you should have the right support. The Dark Iron Fitness Weight belt will keep your back protected like you need. Because so many muscles are involved when squatting, another benefit of heavy squats is that they allow you to achieve progressive overload even faster than other lifts. By overloading the bar gradually, you gain new muscle. Muscle growth is your body’s response to stress and only when stress reaches a certain point then your body is motivated to grow. Significant muscle increase happens when you train at a level that is close to your maximum potential. Related article: What is Progressive Overload? Heavy resistance training increases the muscle cell’s ability to take in nutrients. Heavy resistance is about 85-95% of 1 rep max for you. Do multiple sets with fewer reps. Rest for only short periods of time. If you are squatting really heavy (over 90% of your 1 rep max) then it should be about 2-5 minutes long. If you are lifting moderately heavy (70-85% of your 1 rep max) then your rest period should be in the 30 second to 2-minute range. If you are a beginner weight lifter you can add more weight to your squats almost every week for some time before reaching your strength plateau. When working out you gain strength fastest from the movement that is done first. That’s why placing a barbell squat first in your routine is the most beneficial. Some people hesitate to do heavy squats because they find them difficult and uncomfortable. Pushing past your comfort zone and adding more resistance to your squats will result in soreness and tightness during the first few weeks of intense training. The pain might make you question the benefits of heavy squatting but a healthy diet and rest will have you meeting your goals. Remember that proper form is crucial to prevent injury and to maximize the benefits for this movement. All the benefits discussed here will not happen if you squat with bad form and have bad technique. You will find that squats are one of the most demanding and intense exercises out there, but if you are serious about gaining muscle, you will see that the benefits from heavy squatting are worth the effort. The Dark Iron’s Fitness Genuine Leather Weightlifting belt.